lovely pink roses chintz pattern on a soft yellow background. Made by Crown Trent china Limited. Full size cup with it's matching saucer. 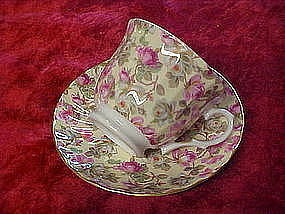 Very lovely and perfect.. Gold trim on cup & saucer edges.